In “Give Me Your Anxiety,” an exhibition of paintings, prints, and sculptures at LaMontagne Gallery, Kim Faler zooms in on ordinary minutiae, making space around the often ignored low-level buzz of managing life. She finds that buzz in the throwaway notes we write to ourselves — the grocery lists and to-do lists. Blowing up snippets of handwritten text she has gathered, Faler re-creates them on rusted steel panels covered in automotive paint. Our handwriting is a personal stamp, and perhaps a barometer of how we’re feeling. Faler scrapes away the paint to render letters and numbers in rust. Her compositions endow lines and loops with gestural import, like the muscular tags detailed in Aaron Siskind’s graffiti photographs. The fragments of words and a horizontal line in Faler’s “Give Me Your Anxiety (Seth)” feel purposeful and frenetic. Yet there’s also something comfortingly familiar here. The notes are quasi-portraits, and they honor mortar that holds our daily lives together. Faler insists that the disposable is actually dear. 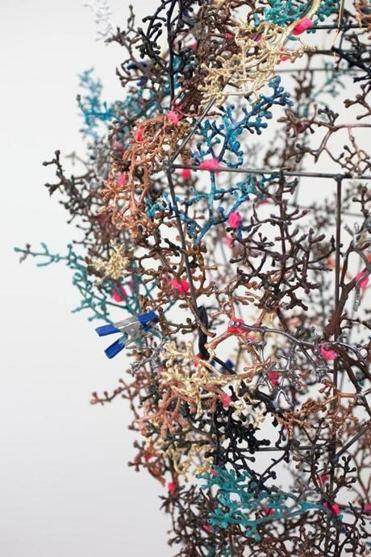 Her attention to small, expendable gestures continues in “Dolly,” a lively sculpture made of electroplated grapevines networking like veins and capillaries around an inverted teardrop shape. Metal-toned vines cluster and reach, fastened together with hot pink dabs of silicone and metal clips. The piece looks at once organic and DIY. The grapevines might be rotting; green pokes through here and there at their tips, and coppery areas oxidize. As in her rust works, Faler pins the urgency of a moment — a dashed off note, a gobbled-up bunch of grapes — onto a larger backdrop of time passing. Indeed, that may be what drives much of our anxiety: In the larger scheme of things, our lives are as quick and casual as post-it notes. This would be a bleak takeaway. But in esteeming the expendable, Faler penetrates worry, and finds tenderness at its heart.